Looking to purchase LocknCharge solutions online? Need some extra accessories for your LocknCharge products? LocknCharge accessories are designed to be used with LocknCharge products. For more information, please contact us. Charge and secure up to 10 devices. A universal solution that can accommodate almost any device. Includes Baskets for devices up to 13" and a wire rack for even larger devices. Charge and secure up to 15 devices. A universal solution that can accommodate almost any device. Includes Baskets for devices up to 13" and a wire rack for even larger devices. Charge and secure up to 10 iPad or tablet devices. Includes baskets for iPad or tablets up to 11". Sync, charge and secure up to 10 iPad or tablet devices. Includes baskets for iPad or tablets up to 11". Store, charge and secure up to ten tablet or iPad devices up to 11"
Store, charge and secure 10 devices of almost any type - up to 13". Small footprint solution that charges, stores and secures up to 32 of almost any laptop, Chromebook or tablet device. Half the footprint of a cart. The Sphero Charging Case™ - designed to charge, store, secure and carry Sphero BOLT or Sphero SPRK+ Robots. Ultra-mobile charging station for iPad or tablets. 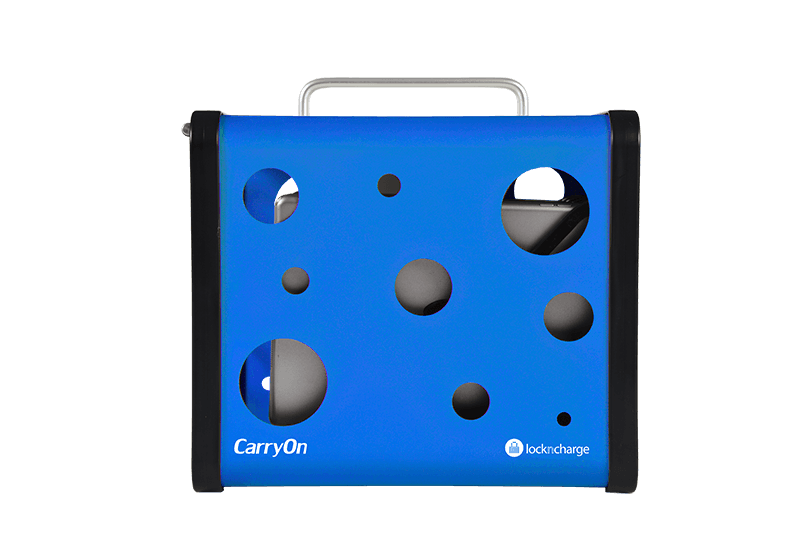 The CarryOn allows you to carry five iPad devices, together with all the charging hardware and cables in one neat and compact unit. Teaching, working and learning anywhere just got a lot easier. The Carrier 20 Cart is designed to accommodate nearly any device type. Featuring Baskets by LocknCharge you can deploy devices in a fraction of the time. The Carrier 30 Cart is designed to accommodate nearly any device type. Featuring Baskets by LocknCharge you can deploy devices in a fraction of the time. The Carrier 40 Cart is designed to accommodate nearly any device type. Featuring Baskets by LocknCharge you can deploy devices in a fraction of the time. The Joey 30 Cart features an easy to use and secure design at an affordable price point. Can accommodate virtually any device type up to 15”. The Joey 40 Cart features an easy to use and secure design at an affordable price point. Can accommodate virtually any device type up to 15”. The FUYL Cell is a 5 bay Charging Locker that is designed to individually store, charge and secure virtually any mobile device up to 17”. Each locker features a digital lock. Stack up to three units on top of one another. The FUYL Tower features 15 individually lockable compartments that can store and charge almost any mobile device. Wi-Fi enabled, once connected to the network admins gain access to an intelligent remote management portal and features. Easily distribute and share mobile devices. Small Mobile Device Baskets for devices up to 11"
Available in Red, Blue, Green, and Yellow or in multi-packs. Buy now or view the range on Amazon. Large Mobile Device Baskets for devices up to 13"
Set of 8 Large Basket rims to remove dividers and allow you to use wider devices in the Basket. Easily transform your cart to fit larger devices. If you devices are too large for our Baskets by LocknCharge, you can purchase wire racks to replace the baskets in your cart. Easy to install, they just rest on the shelf, and you can customize your cart to fit your deployment needs - half of the cart baskets and half the cart a wire rack if needed. The LocknCharge Keyed Padlock with logo allows you to replace the lock on an existing LocknCharge product that uses a Padlock. Resettable 4-digit combination padlock - no more lost keys! Resettable 3-digit combination padlock - designed for LocknCharge CarryOn. Where extra security is needed, you can purchase an optional LocknDown Kit for your LocknCharge Cart. Secure your Cart to the floor or wall with a heavy-duty chain and keyed lock. The FUYL Cell Pedestal is the perfect complement for FUYL Cells that have been stacked. The Pedestal helps elevate the FUYL Cells from the ground to provide easier access to the lower compartments and acts as a storage compartment for the power. The Putnam Pedestal is the perfect complement for stacking either the Putnam 8 or Putnam 16 Charging Stations. Use the Putnam 8 Wall Mount kit to mount your Putnam 8 Charging Station to the wall. Use the Putnam 16 Wall Mount kit to mount your Putnam 16 Charging Station to the wall. If you have had damage to your Cart's power cord, you can purchase a replacement power cord.